Best Seller! SkyView 4 is one of our most popular sky and cloud designs. Imagine lounging on the beach and looking up at the deep blue sky. Seagulls soar overhead and palm trees sway in the warm ocean breeze. The sound of waves crashing in the distance is like a lullaby. Kinda makes you want to drop everything and seek out your own little slice of paradise right now, doesn’t it? While most of us don’t have the luxury of taking off to the coast whenever the desire arises, you can ditch the harsh fluorescent lighting and bring some oceanside serenity right into your home or office. 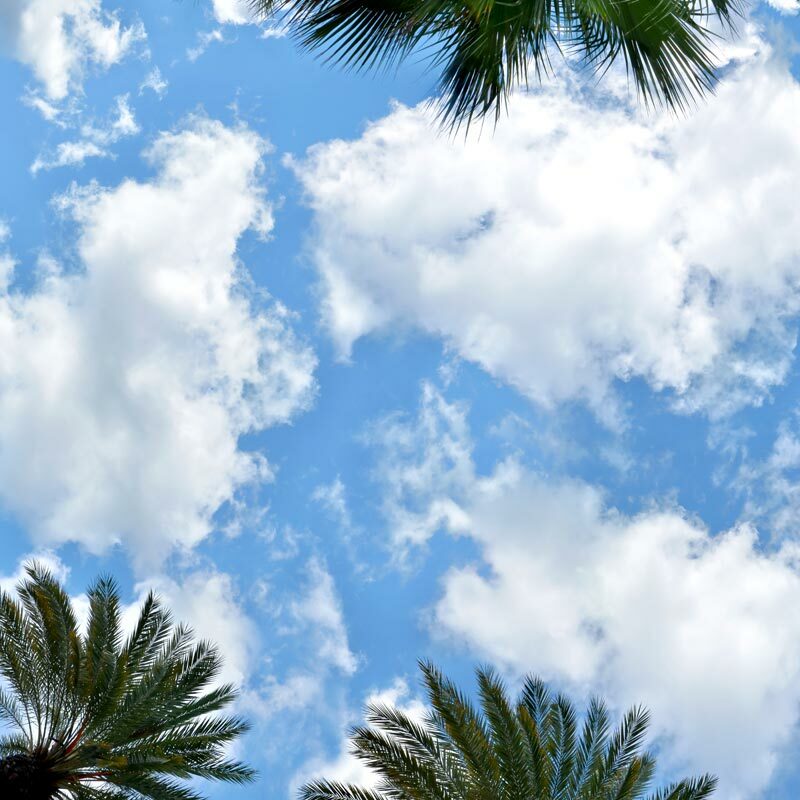 SkyView 4 features a great assortment of beautiful blue skies lined with palm trees. 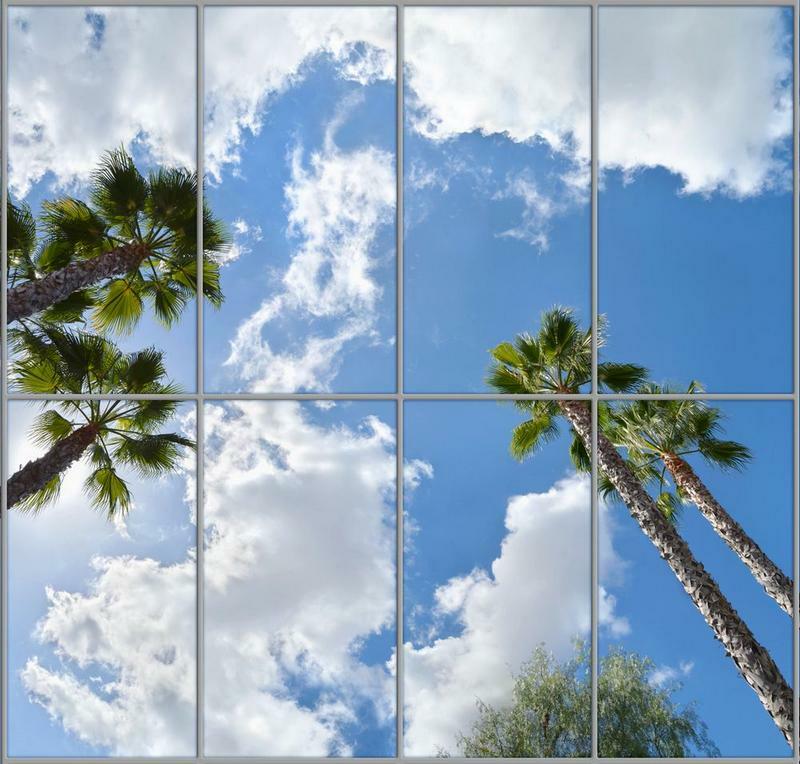 Our sky cloud ceiling panels are a relaxing, realistic, and perfect for indoor rooms that lack natural light. Owner of SkyView 4...love the colors and birds. Great quality. Friend said it was so realistic he felt he should duck so he didn't get pooped on by seagulls. This product was perfect for our windowless lunchroom here in sunny Florida! Great quality and easy to install. The entire office voiced approval! It's a hit! It adds a relaxing atmosphere. Everybody loves it. A beautiful image. Looks like our usual sky here. We work in an underground bunker and cannot have skylights or windows. Really nice, my little piece of ocean side in my COLD New York kitchen. I look up and pretend! You should have seen what I used to have in place, it was broken and hanging down, I had an old curtain hanger holding it up. I'm glad I found your website.